Here’s an internet meme to celebrate National Pet Day (even though it was yesterday). The feline is Julian Assange*’s cat Michi, pictured in the Ecuadorian Embassy in London in 2016. After Assange’s arrest on Thursday, Ecuador threatened to put Michi in an animal shelter – but the kitty kat is now reportedly with Assange’s family. 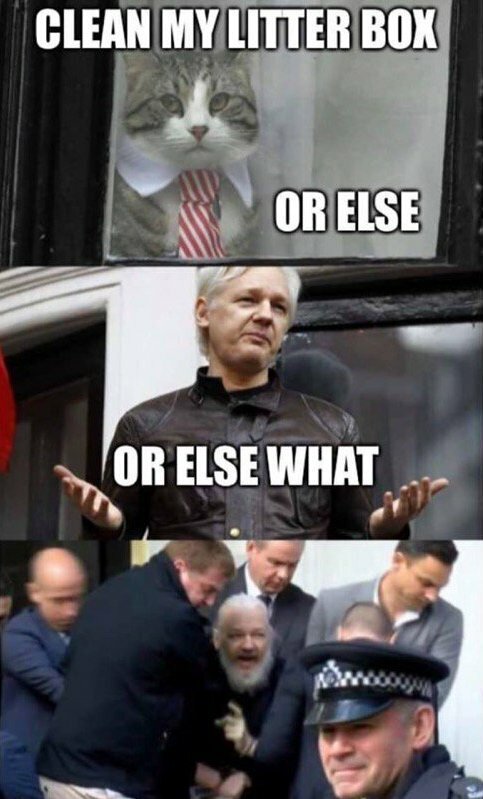 *Assange is an Australian journalist, computer programmer and the founder and director of WikiLeaks [Source: Wikipedia]. ‘There is an end to everything, to good things as well’. Proverb that dates back to about 1374 (Geoffrey Chaucer, poet). We learned yesterday that the reason the Rolling Stones had to postpone their upcoming concert in May in Seattle, was for Mick Jagger (75) to undergo heart surgery (a heart valve replacement). Yikes. Apparently surgeons can work new wonders these days with a much less invasive procedure, but even so. Is this not a sign for Mick and the Stones to finally, just pack it up, and call it quits? 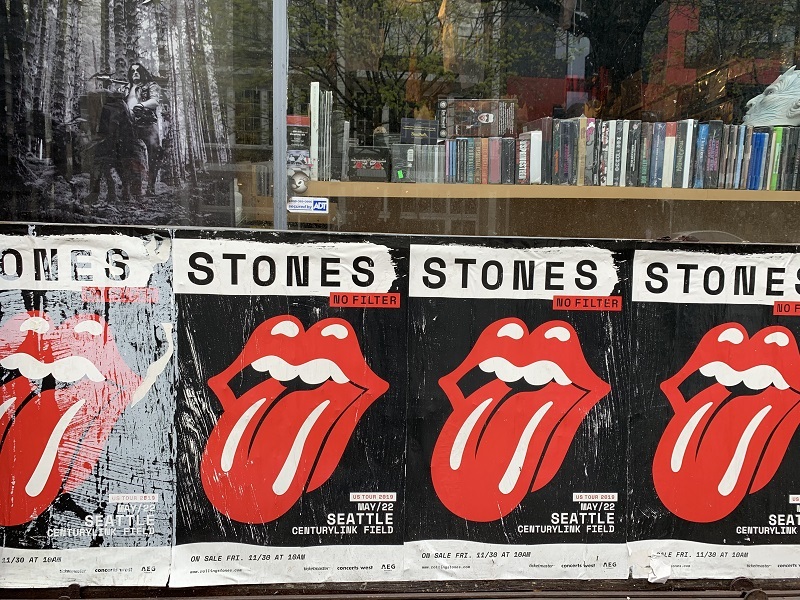 Posters on Pike Street here in Capitol Hill, for the Rolling Stones ‘No Filter’ concert that had been planned for May here in Seattle, but that is now postponed. (That red tongue logo debuted in 1971). I saw the Rolling Stones in St Louis in 1996 – their ‘Bridges to Babylon’ tour. With the internet brand new at the time, there was a projected computer screen on stage. Fans could e-mail in requests for songs – from their hard-wired desktop or notebook computers at home, I suppose. There was no Blackberry, no smartphone, no wifi, nothing mobile like that. 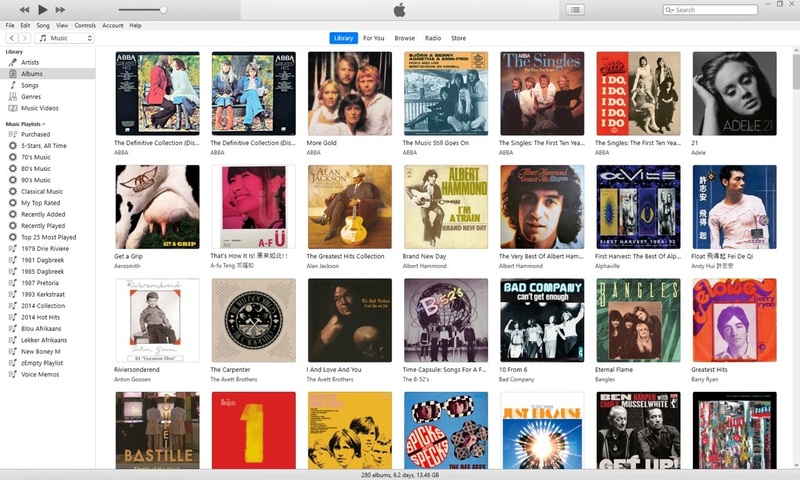 Alright .. I’m done for now with my iTunes tune-up. It was a lot of fun. In some cases I broke the ‘rules’: uploaded a singles album cover from online, if I had only imported the hit song from a full CD, and I did not like the CD cover much. In other cases where I had multiple CDs for one artist or group (ABBA), I could upload several cool old vinyl covers or CD covers. Check it out! All the little squares are filled now .. (top left) the first two pics are from the original ABBA’s Greatest Hits. That was on vinyl and I had the record for many years. On the right, Bennie is kissing Anni-frid on the park bench, and on the left Agnetha is hoping (I think!) that Björn will notice her. 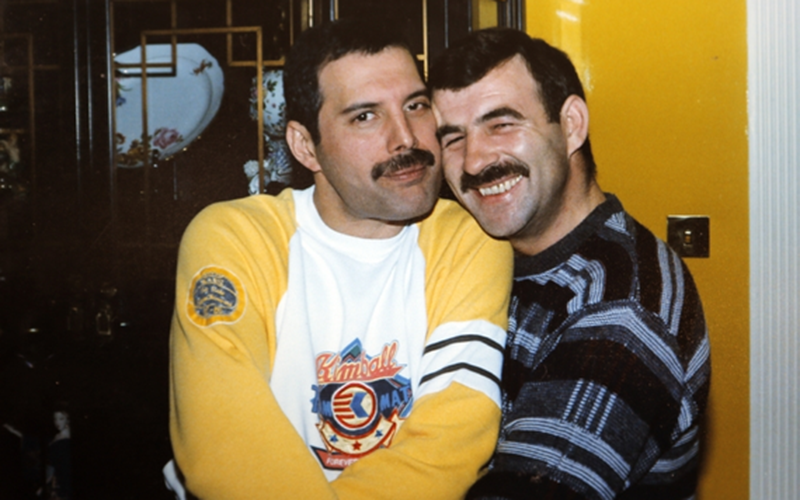 (They were in fact married at the time. Bennie and Anni-frid would marry each other many years later). Further to the right are two vintage ABBA covers, one for People Need Love and one for I do, I do, I do, I do, I do. In the second row, I like the two Albert Hammond covers that I found online, and uploaded. And I especially like the Barry Ryan cover for Eloise, far right on the third row! Here comes 2019.. Happy New Year! It’s just about 2019 here in Hong Kong. By 9 pm, the Hong Kong Police Dept. 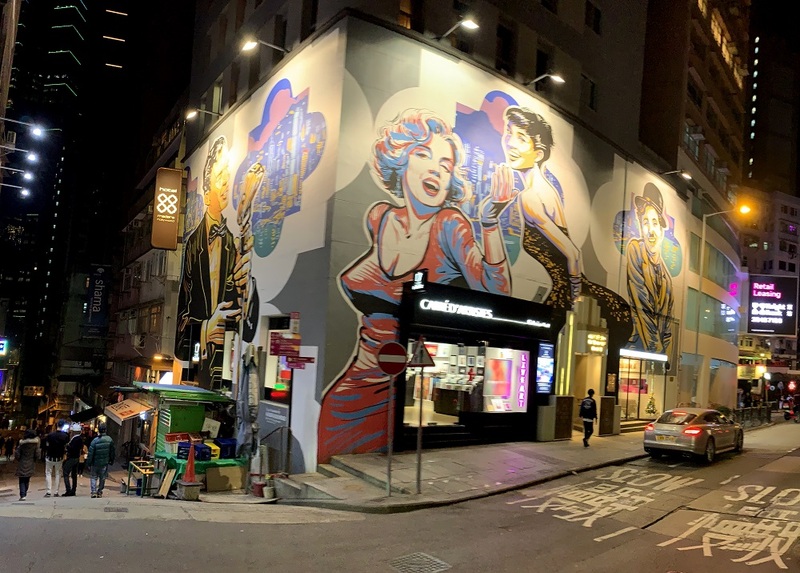 were out in full force in the small square of streets called Lan Kwai Fong in the Central District (party central for expats and locals alike). The surrounding streets were closed for traffic. Also: the Yung Kee Restaurant nearby had posted a sign by the entrance ‘Our Signature Charcoal Cooked Goose Has Been Sold Out’. (Aw. Out of goose on New Year’s Eve. And I guess wait staff could no longer announce ‘Your goose is cooked, sir!’, as they put the goose on the table). The scene in Lan Kwai Fong at about 9 pm. (No, I was not going to hang out there until midnight! Leaving that to the younger ones). HAPPY NEW YEAR 2019, says the letters on the pub named Ciao Chow. Giant paintings of Frank Sinatra, Marilyn Monroe, Catherine Hepburn, and Charlie Chaplin on the Hotel Madera nearby are festive for any night, and especially for New Year’s Eve. 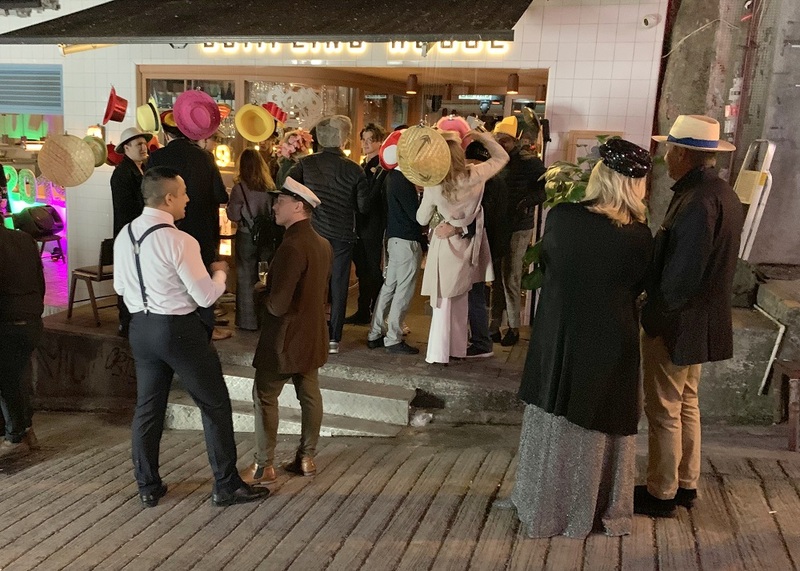 This is a Mad Hatter’s party a few blocks away. (I see some people have cheated: they have no hats!). 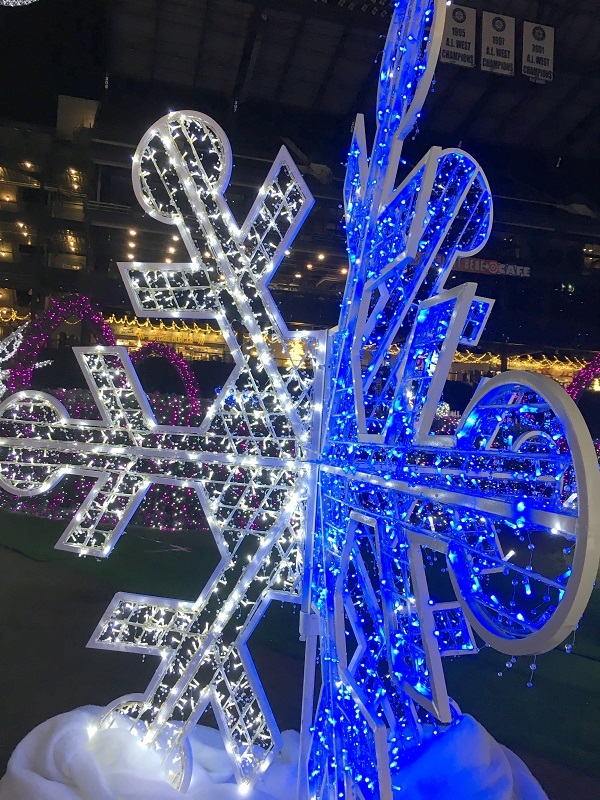 The Seattle Mariners baseball field – south of downtown – is set up as a Christmas light maze (the Seattle ‘Enchant’ Christmas market and festival). So that’s where we went after beers & dinner tonight. 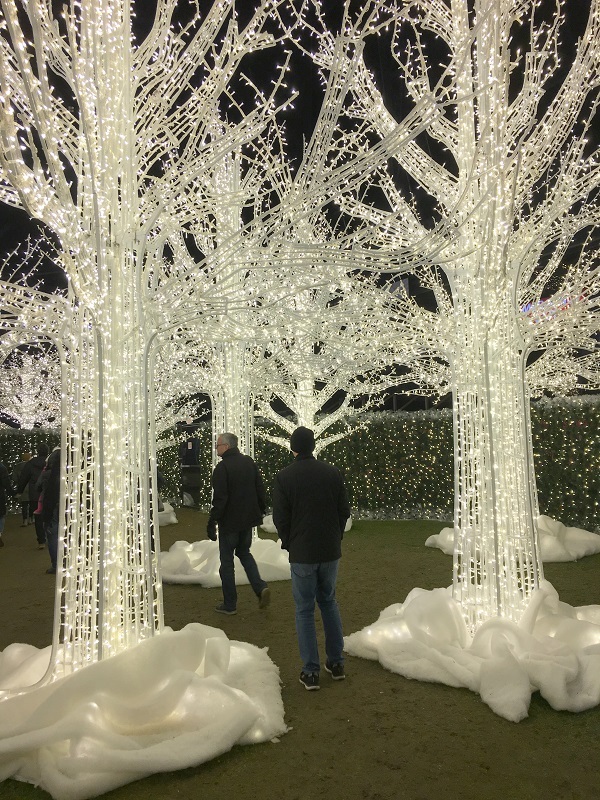 There were forests of light trees, a scavenger hunt for Santa’s reindeer in the maze, and a little ice rink as well. 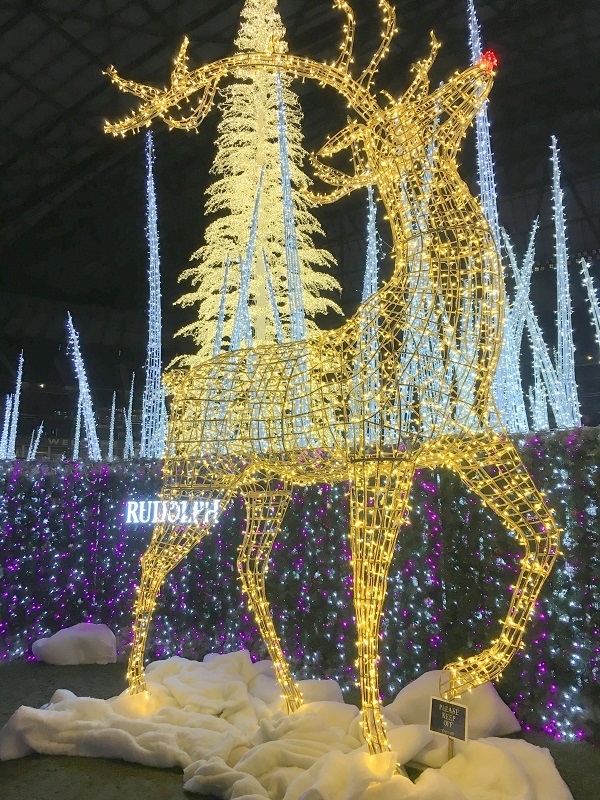 In a forest of light trees ..
.. and here’s Rudolph (the Red-nosed Reindeer), one of nine of Santa’s reindeer, hidden in the maze. Some of them are lying down, and it took us a little while to find the last one, called Cupid. 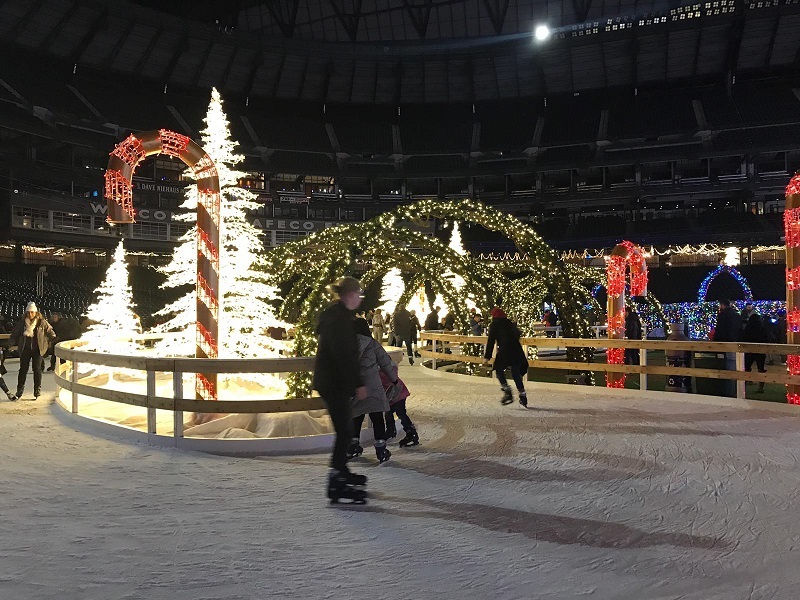 These skaters look very comfortable on the ice of the little ice rink. We did not set foot on there! [Photo credit: thanks to Bryan for the picture]. 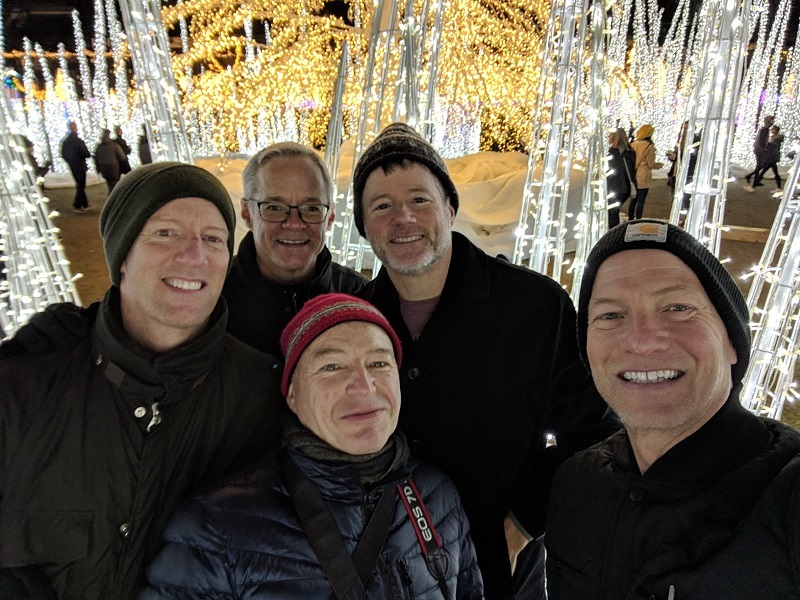 And here’s a selfie of the friends – from left to right Ken, Steve, Willem, Bryan & Gary. Yes, it was a little chilly! 43 °F/ 6 °C. 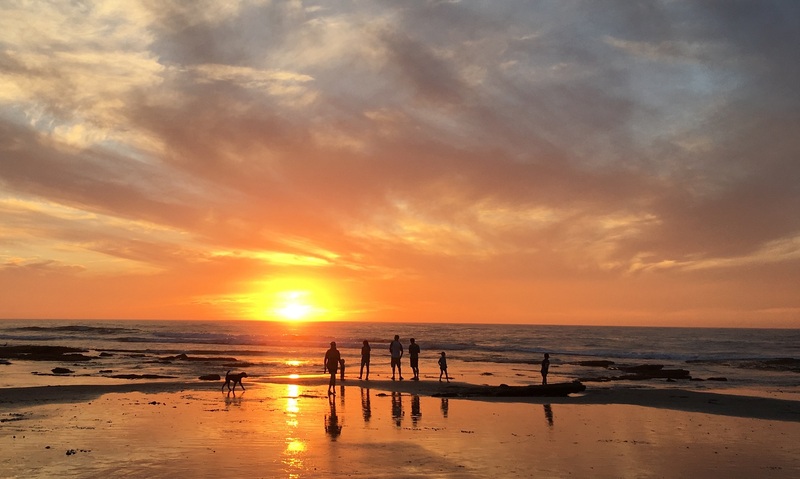 [Photo credit: thanks to Gary for the picture]. ‘President Trump’ was again featured in this Saturday’s SNL cold open, portraying him and other world leaders at the G20 meeting in Buenos Aires. Hmm. Is this really funny? I thought. In this case, Putin and Mohammed Bin Salman are – by all credible accounts in the real world – savages, directly responsible for murdering their political enemies. They should be persona non grata at the G20 (and maybe they are). So is it cool to ‘celebrate’ and poke fun at them? I guess I’m too serious. This is simply an offer to the audience to escape the horrors of the real universe, and jump into a parallel one of parody, for a little while. Another problem could be that I only have one beer on a Saturday night, and not three or four, as I’m sure most in the studio audience must have had! 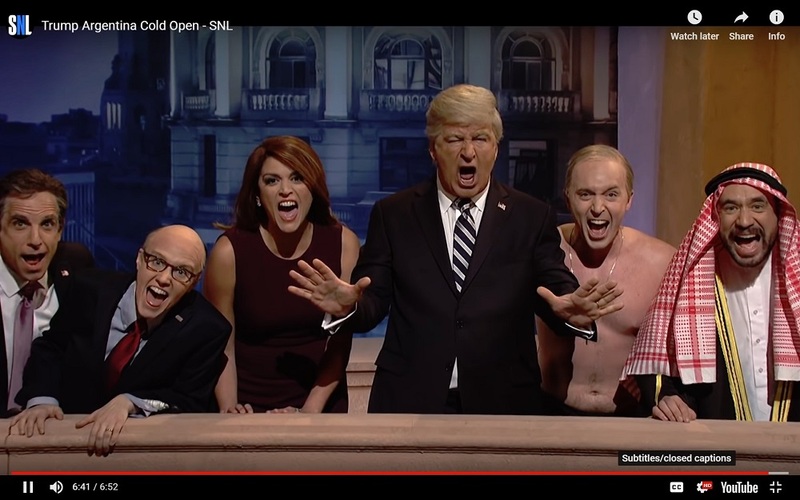 ‘Live from New York, it’s Saturday Night Live!’ yells the cold open* cast of characters, from left to right: ‘Michael Cohen’ (Ben Stiller), ‘Rudy Giuliani’ (Kate McKinnon), ‘Melania Trump’ (Cecily Strong), ‘Donald Trump’ (Alec Baldwin), ‘Vladimir Putin’ (Beck Bennett), ‘Mohammed Bin Salman’ (Fred Armisen). *In television production parlance, the ‘cold opening’ or ‘cold open’ is a one to five minute mini-act at the beginning of the show, even before the opening credits, that is used to set up the episode and catch the audience’s attention. 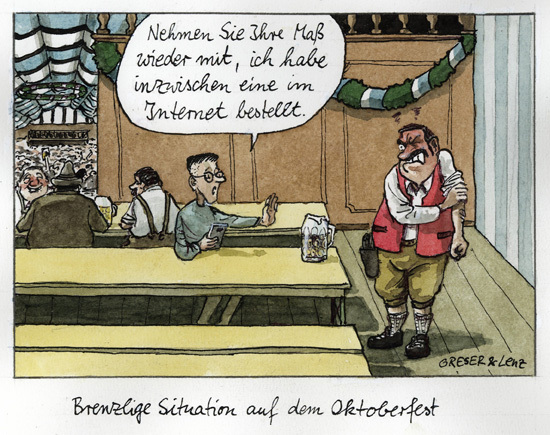 Oktoberfest 2018 in Munich is over, but here is a cute little cartoon from German cartoonists Greser & Lenz. 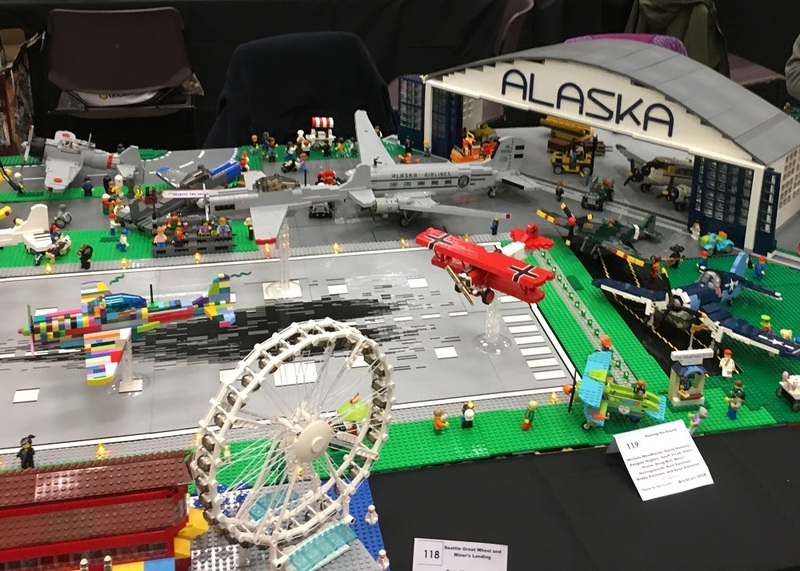 We went down to the annual ‘BrickCon’ LEGO exhibition, at Seattle Center today. 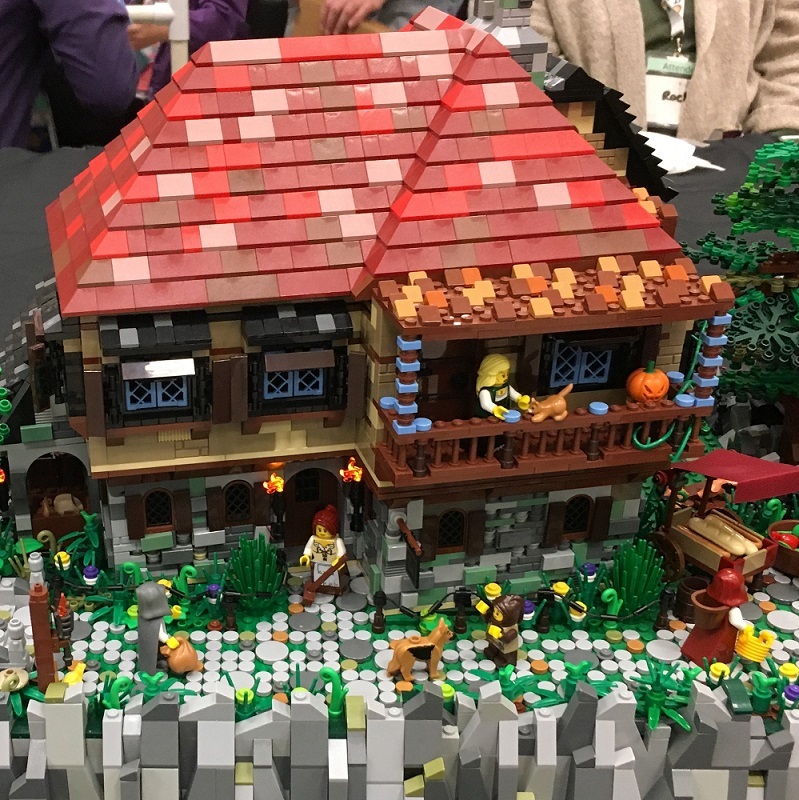 This is where LEGO master builders show off their work, and fans come to admire it. Here are some of my favorites. 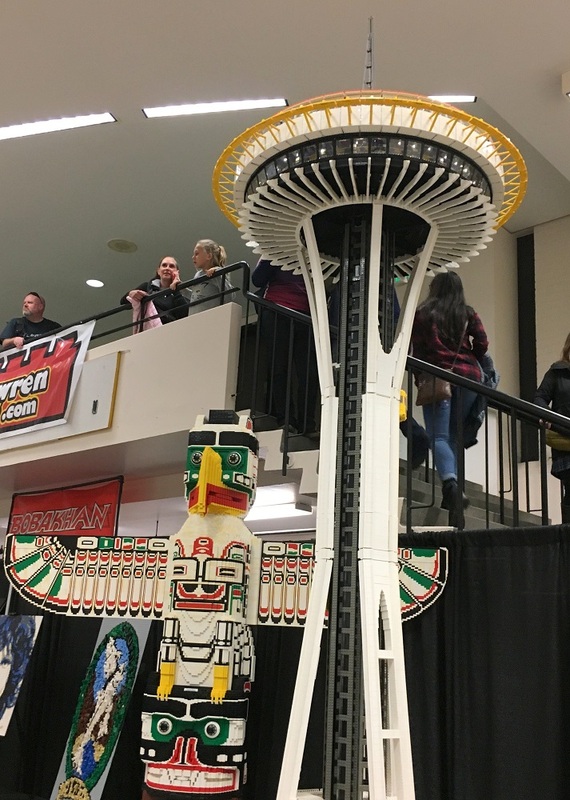 Got to have a LEGO Space Needle, of course. This one was built by Wayne Hussey in 2012, to commemorate the 50th anniversary of the real Needle. 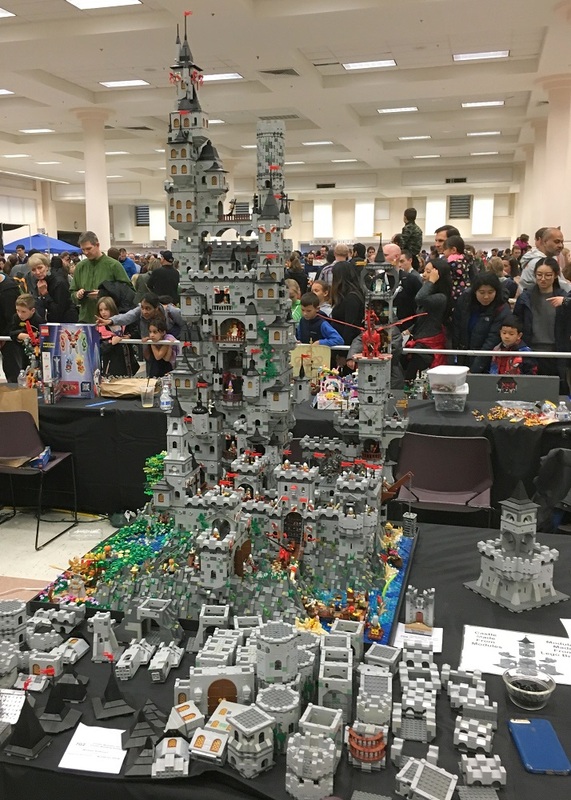 It took 800 hrs, over 6 months, and has more than 50,000 bricks. (And I love the totem pole in the background). 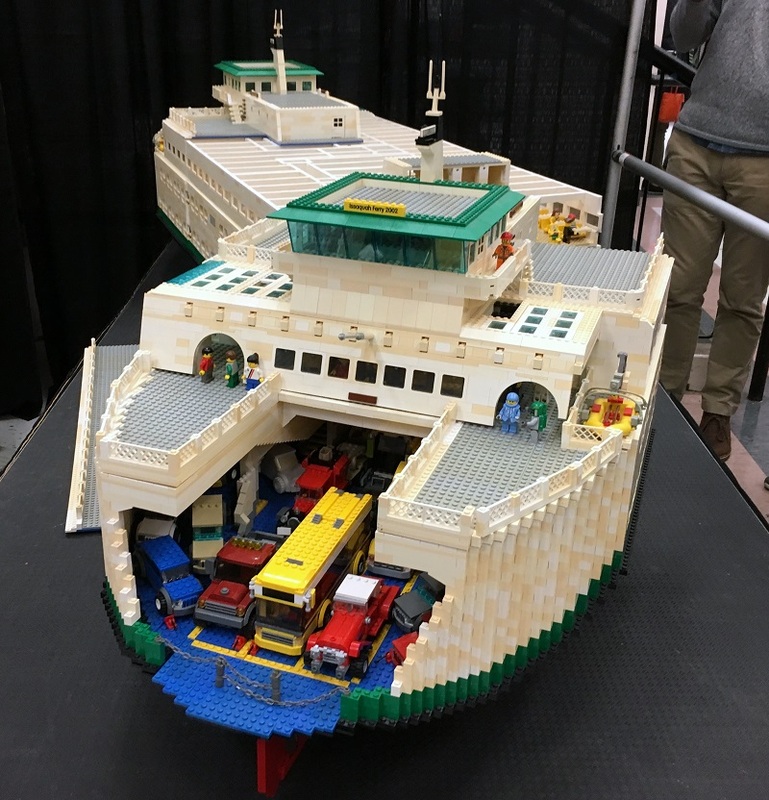 Elaborate model of the ferry Issaquah, with bridge and deck equipment, minifigures and filled up with all kinds of vehicles, to boot. Alaska Airlines hangar with landing strip, complete with skid marks. Lots of airplanes, and a wildly colorful flying machine taking off! Seattle waterfront Ferris wheel in the foreground. This ‘Matt’s Rollercoaster’ model was the pièce de résistance of the exhibition, in a way, featuring a fully functional roller coaster rail and car. 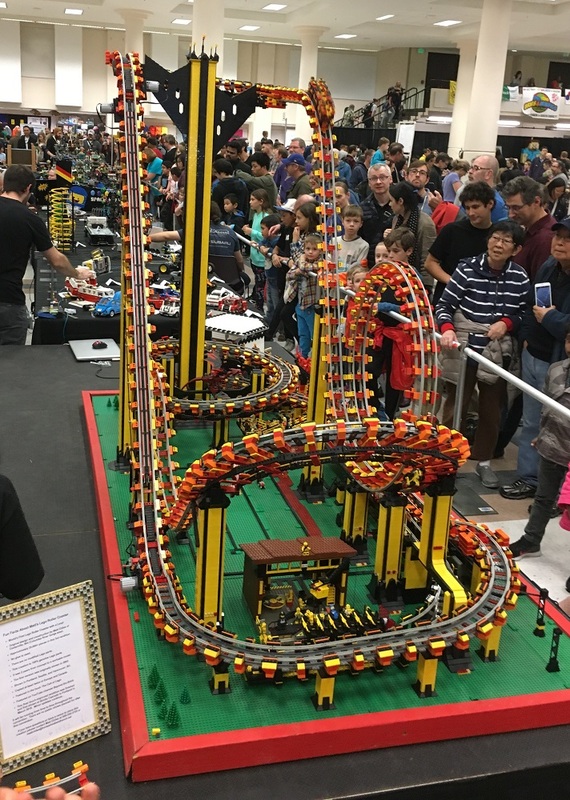 It was built from 20,000 standard LEGO pieces after two years of design work. Check out the top right of the coaster: the car is about to plunge down on the rails and into the loop (! ), to end up back at the start. Whoah .. and how about this 15-storey medieval megacastle, with its dragon (on its landing pad), moat, drawbridges & knights. I am sure enemies from the ends of the earth can be spotted by the guards in the turret at the top. 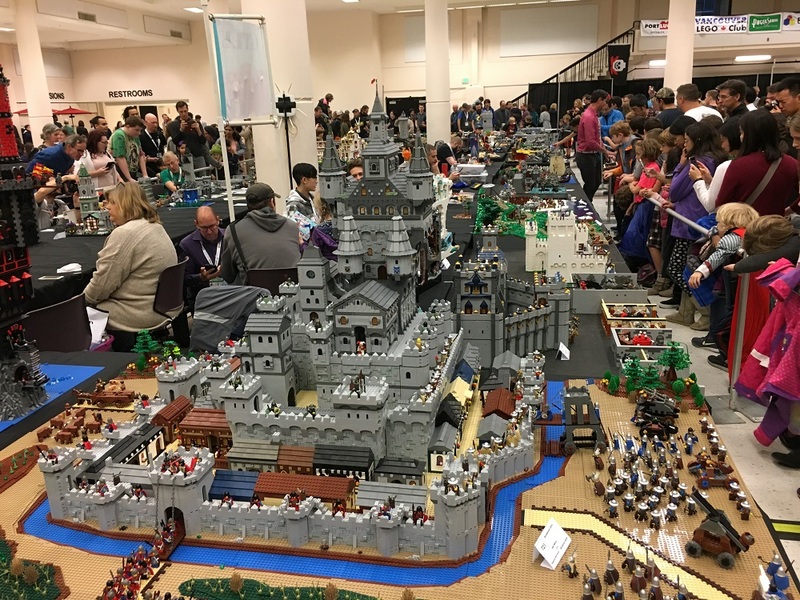 Another castle, styled with terraces and lots of minifigures on the attack. (The still have to deal with the castle walls and the moat, though). Here is a Halloween house. I love the roof with its reds and pinks, and the other details. 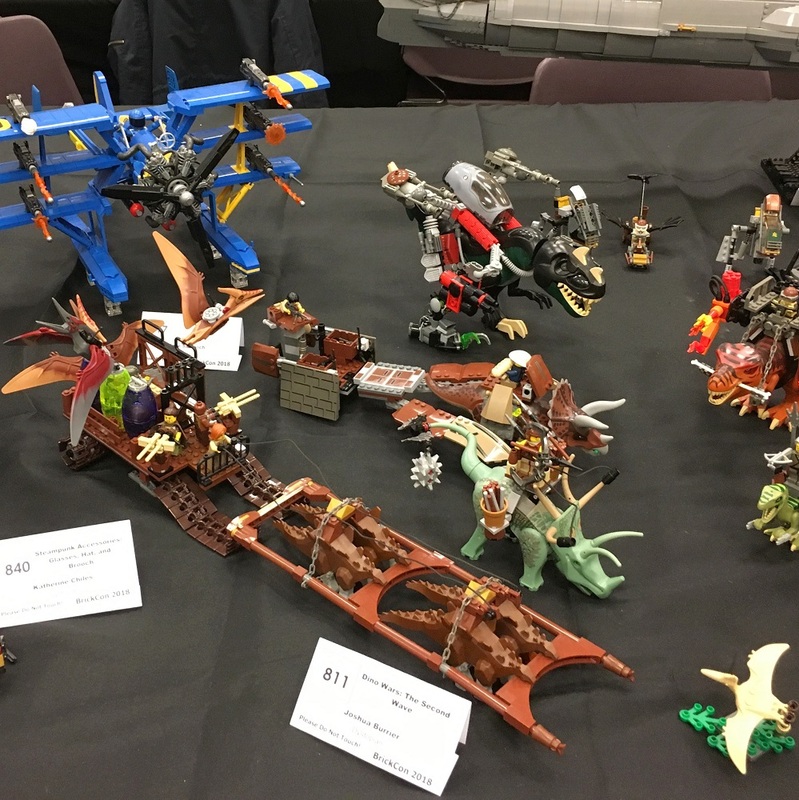 The dinosaurs/ ‘dino wars’ is another LEGO theme, some sets licensed from the Jurassic Park movie franchise. 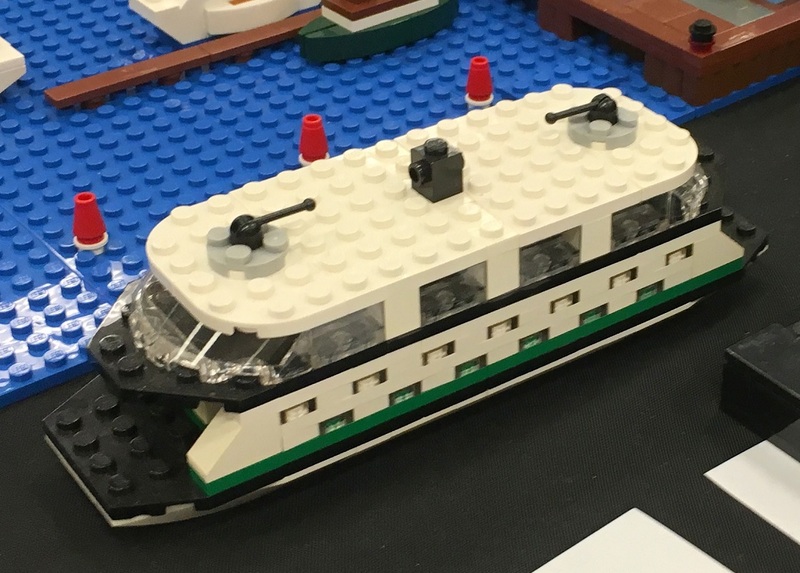 Finally, a style of LEGO that is called ‘microbuilding’, challenges the builder to create a miniature model of something, such as this Washington State ferry. Nicely done. (The trick is to have a large superset of bricks to tinker with and select from, to put together). I am under the weather. Sometimes today I had to put on several layers of clothes to keep me warm out of bed, and to keep the chills under control. 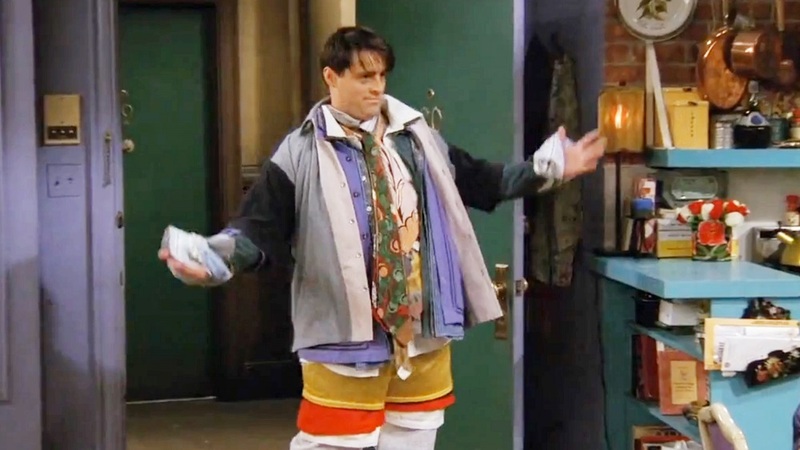 ‘That reminds me of the Friends episode with Joey wearing all Chandler’s clothes’, I thought. I see actor Ryan Reynolds’ gin has arrived in Seattle (Aviation Gin). It made me think of our gin of choice, for after-work cocktails, back when I worked in China: Bombay Sapphire. So I should give the Aviation Gin a try. P.S. Alas, party-pooper researchers have published the results of a sweeping global study in the Lancet, that says that not even modest amounts of alcohol is good for one’s health. What is one to do? 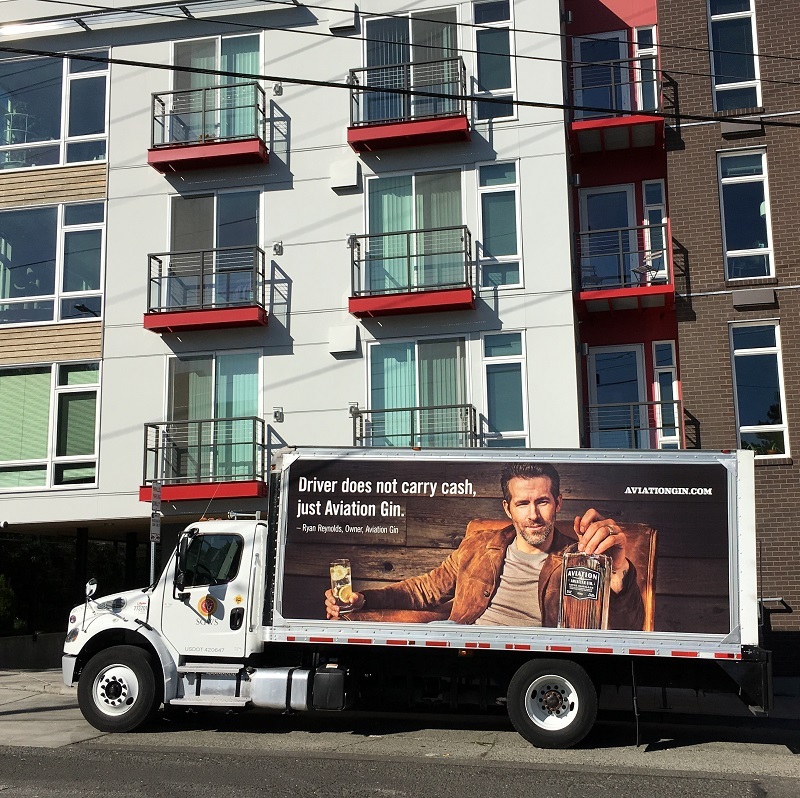 Spotted here on 15th Ave, on Capitol Hill: a delivery truck with a poster of Reynolds, promoting his new gin. Described as an ‘American gin’, Aviation Gin is handcrafted in small 100-case batches by a small, dedicated team of master distillers in Portland, Oregon. Here’s a 2012 set called ‘Kingdoms Joust’. A joust is a horseback fight with lances, as shown. The king and the queen are looking on, with some peasants going about their business. Below is the used LEGO Castle #6075 set from 1981 that I had bought from a Craigslist seller in Tacoma. I had to fill in quite a few yellow brick pieces of my own. I bought it knowing there were no knight or horse minifigures. (Aw). The red drawbridge is also missing its pulley and rope, used to draw it close. Fun as it was, to build this set, it’s really outdated. 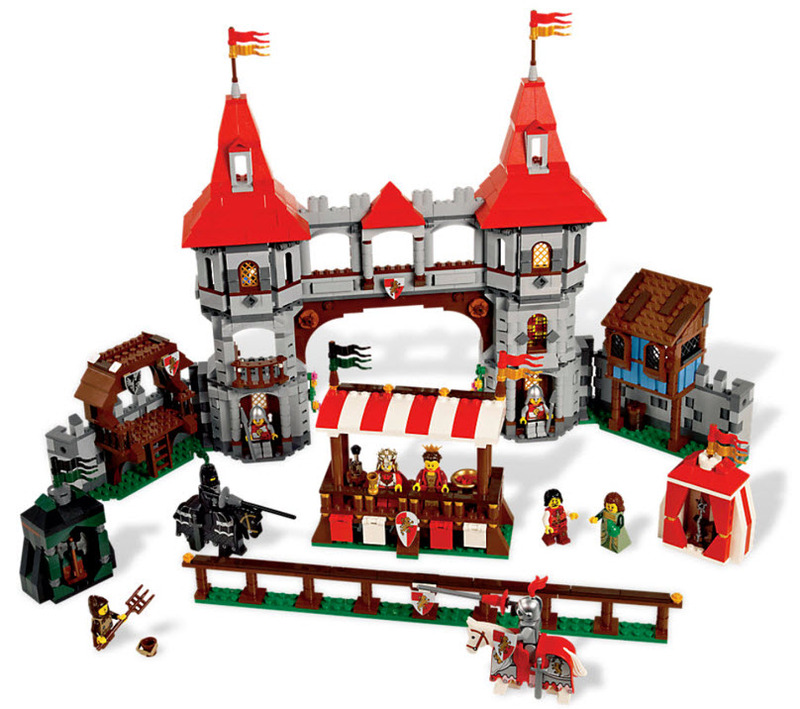 The modern medieval sets from LEGO use gray bricks and not yellow, roof tiles, and add in a lot more detail to the castle walls and roofs, and to the minifigure characters (see the picture of ‘Kingdom’s Joust’). 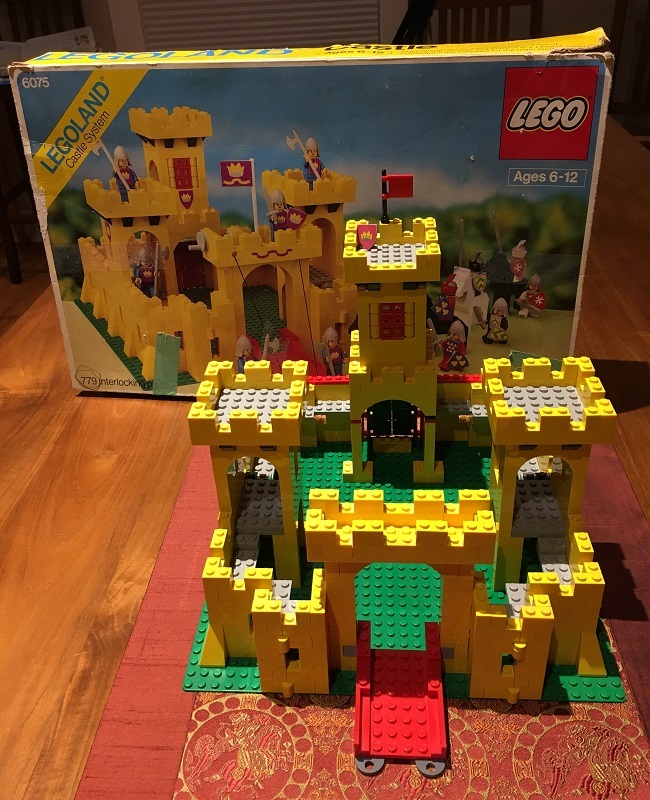 The LEGOLAND Castle #6075 set from 1981. My set has no knights or horses. They are hard to find on the used market, given that the set is so old. I should just get a new set such as Kingdoms Joust, with knights and horses to use when displaying this one. The popcorn movie ‘The Meg*’ is out on the circuit. Even though I have not seen it yet, it’s fun to check the movie’s trailer online, and the posters for it. The movie is a co-production with China, and features actress Li Bingbing alongside Jason Statham. 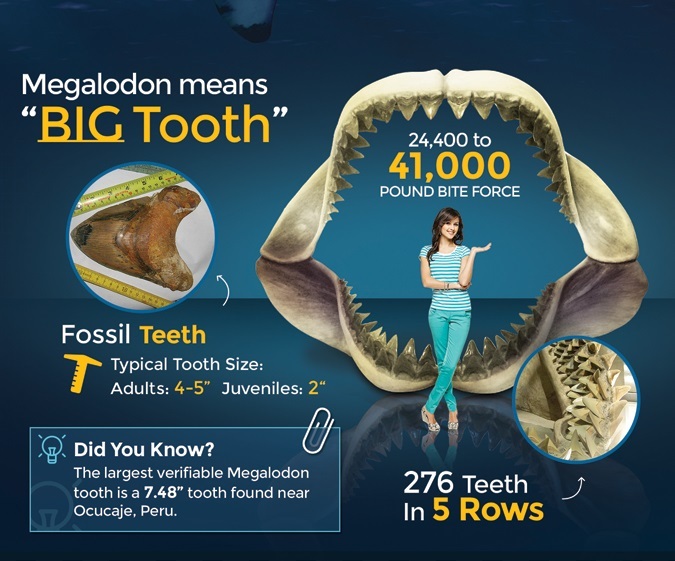 *Short for Carcharodon megalodon, a really, really big shark (60 ft/ 20m) that roamed the oceans until about 2.6 million years ago. Movie posters in different languages. 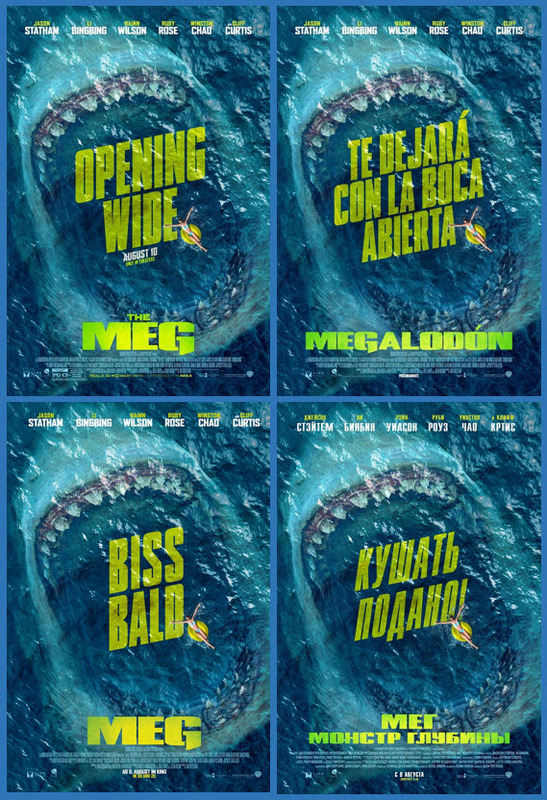 Let’s see: Opening Wide is a movie reference (the movie opens in a large number of theaters) | Spanish ‘Te dejará con la boca abierta‘ – It will leave you with your mouth open | German ‘Biss bald‘ – ‘Bite’ you soon; a word play on ‘Bis bald’ – See you soon | Russian КуШАТь ПОДАНО! – Dinner is served! 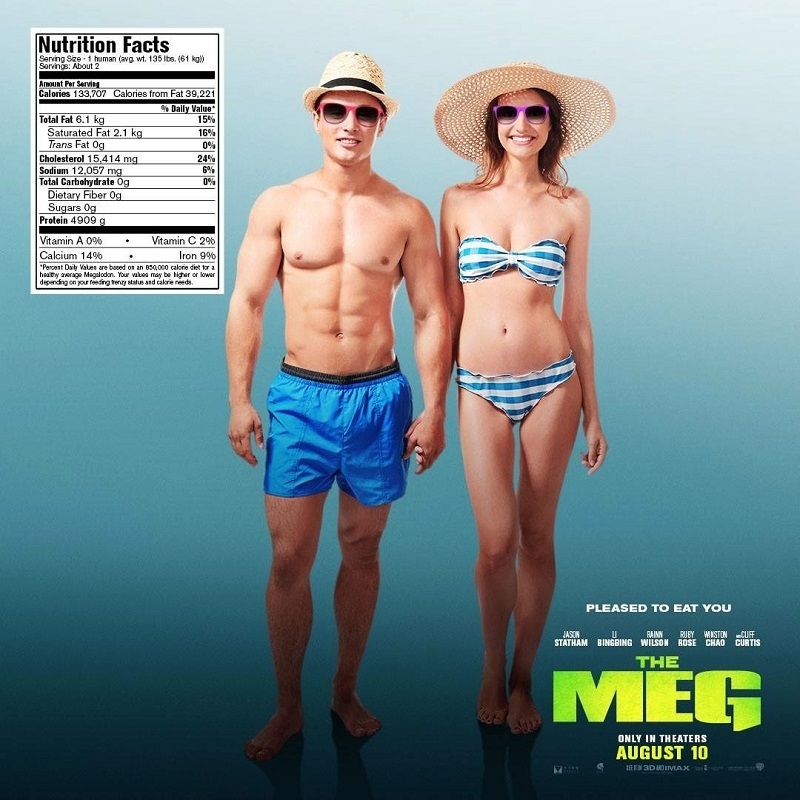 An alternative movie poster with the tagline ‘Pleased To Eat You’ and two beautiful beach Homo sapienses as shark food, complete with an American food label. 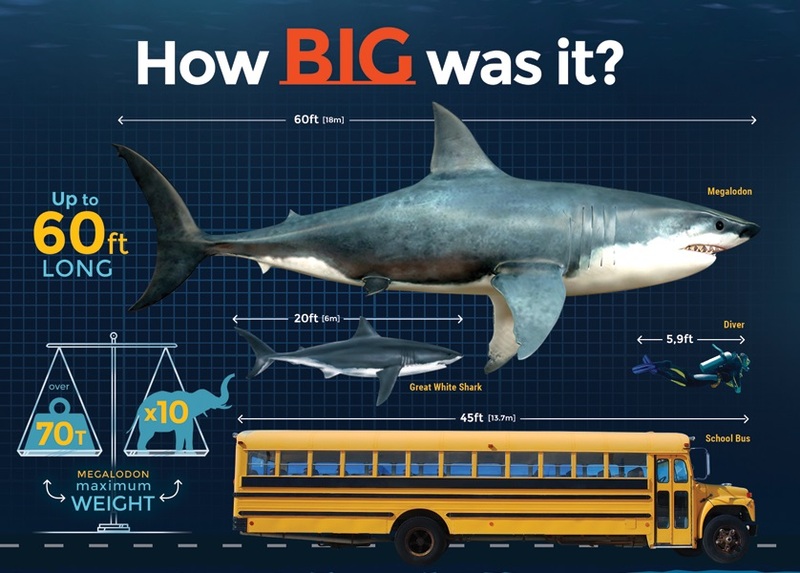 I am very sure the megashark will not peruse the food label beforehand ! Here’s a simple Texas-themed construction. I was inspired by pictures that I found online for a 1977 set called ‘Texas Rangers’. The original Texas Rangers set had horses and cowboys in. 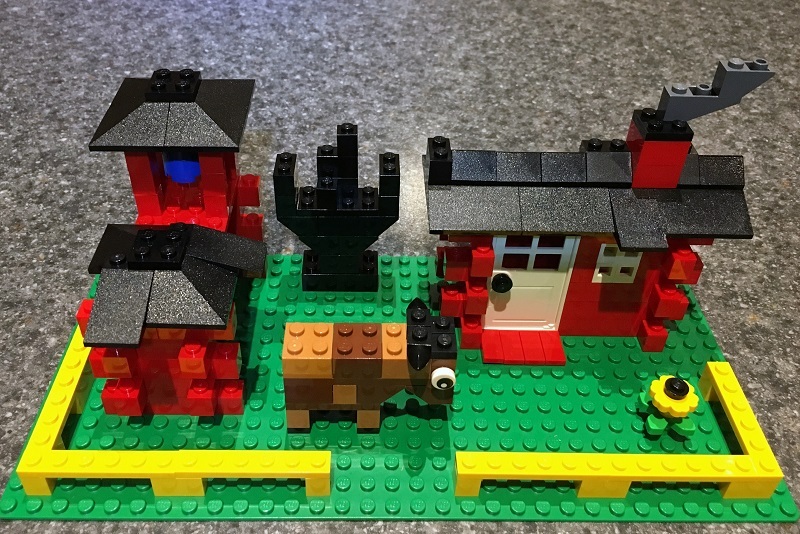 I did not have bricks to build those, but added a cow that I had on hand. (That cow is about to walk over, and chomp that yellow flower in the corner). May I present the new and improved version of what I will call ‘LEGO House on the Hill’? The original one was only a shell, with no floors, and not much detail inside. 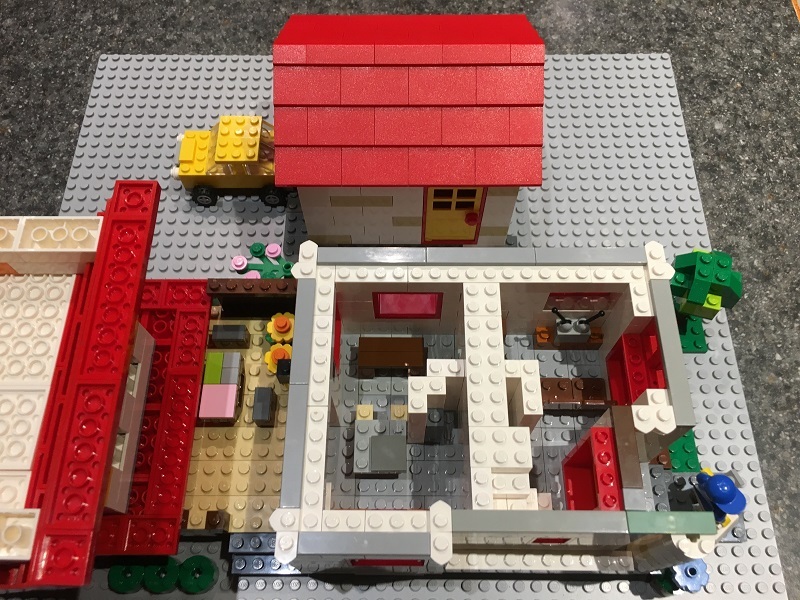 This house is still very compact, and built with pretty basic bricks. 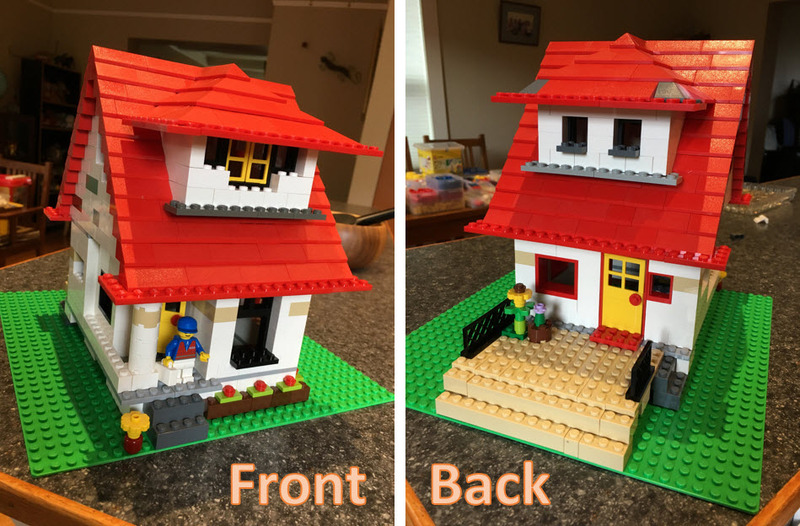 I don’t have custom furniture and kitchen appliance bricks that come with some LEGO house sets – yet. Front view. I should change out the baseball cap, or the briefcase, on the house resident. The cap & briefcase don’t really go together. The back of the house. The garage still needs a little work. Here’s a ‘Google Earth’ view, looking down on the roof. Top floor, with the roof removed. Stairs from the ground floor lead into the hallway. Bathroom is to the left with blue furnishings. Main bedroom on left with grey bed, guest bedroom on right with orange bed, study at top with a brown desk. Ground floor. Staircase by the front door. Kitchen on the bottom left with island, with dining room & brown table top left. Top right is the living room with TV and sofa. I went to see Love, Simon, on the spur of the moment today. 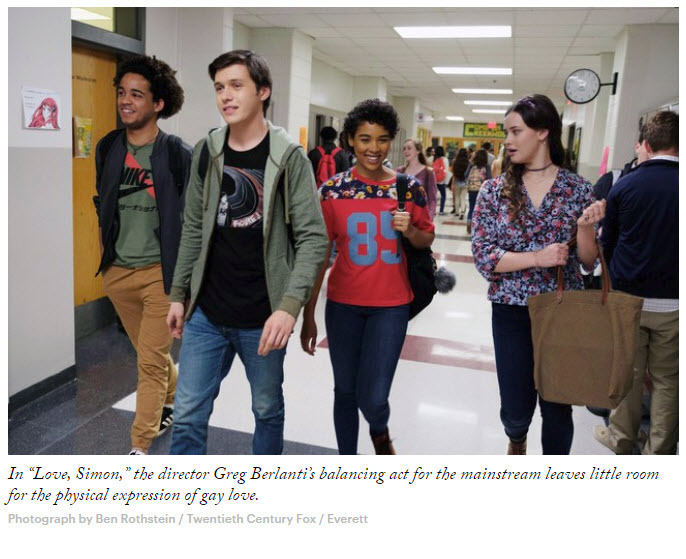 It is a coming-of-age film, a romantic comedy-drama about a closeted gay high schooler called Simon. (He is forced to come out of the closet – of course. He makes mistakes in the process, hurts people, but his parents and friends are supportive). I see some film critics wonder if the movie is already too little, too late, for today’s kids for whom being gay is – finally – O.K. So they don’t need this movie. Well, I think I disagree. The movie will be watched by old guys like me, and by parents, and by gay kids that have a rough time where they grow up. And it will mean an awful lot to them. Picture from the movie, and comment from the New Yorker magazine. From left to right the characters and friends Nick, Simon (actor Nick Robinson, a Seattle native), Abby and Leah. The film is hailed as a first: a major studio backing a gay director making a gay-themed movie. (Robinson is straight). The movie is based on Becky Albertalli’s 2015 book ‘Simon Vs. the Homo Sapiens Agenda’. I did not buy the big T-Rex I saw at Toys-R-Us (my post a few days ago), but this red one at Walmart was on sale for just $1.97. 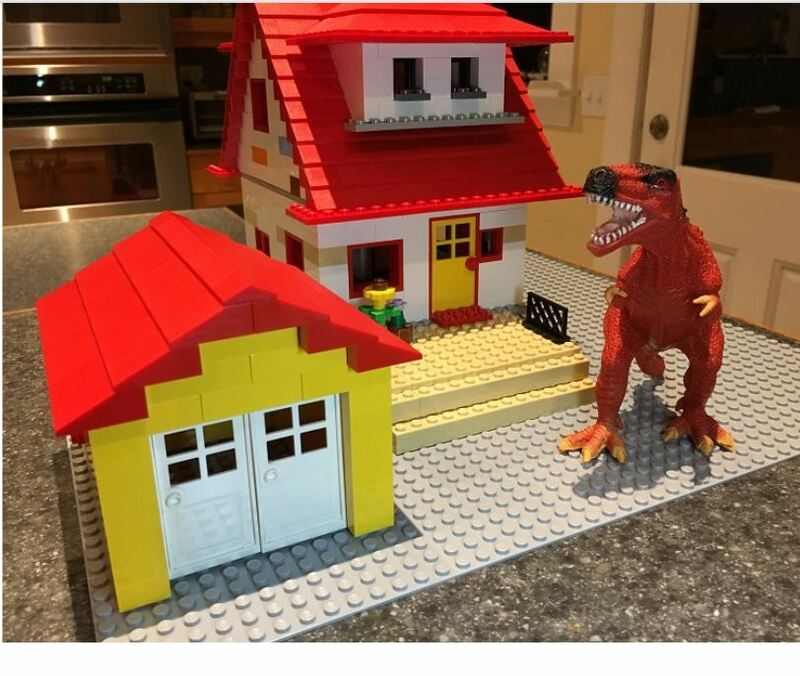 Besides, the dinosaur – the terrible lizard * – goes nicely with the garage that I added to my Lego house. It’s all just for fun. I will eventually box up these toys and donate all of it to Goodwill. *Dinosaur comes from ancient Greek δεινός (deinos), meaning ‘terrible, potent or fearfully great’, and σαῦρος (sauros), meaning ‘lizard or reptile’. 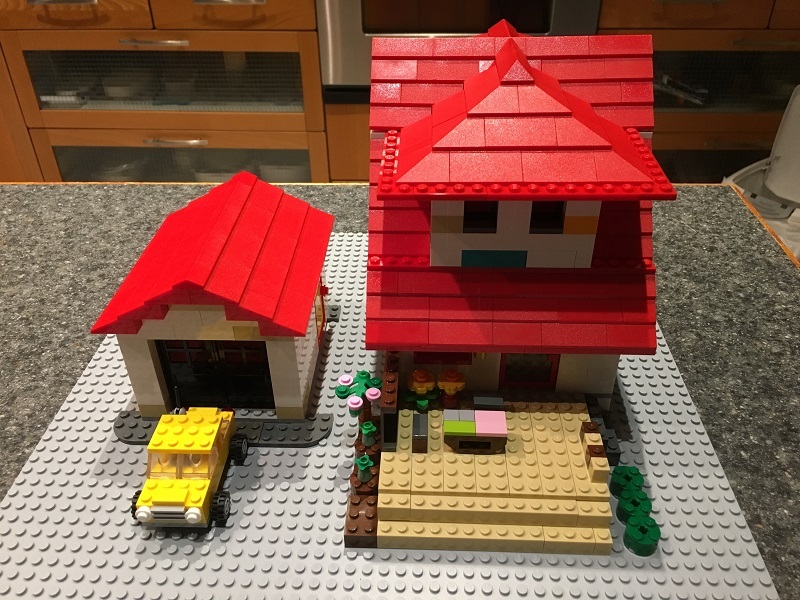 What would my actual house look like in Lego* bricks? I wondered. Well, only one way to find out, I thought: build it – and so I did. I’m pleased with the result. 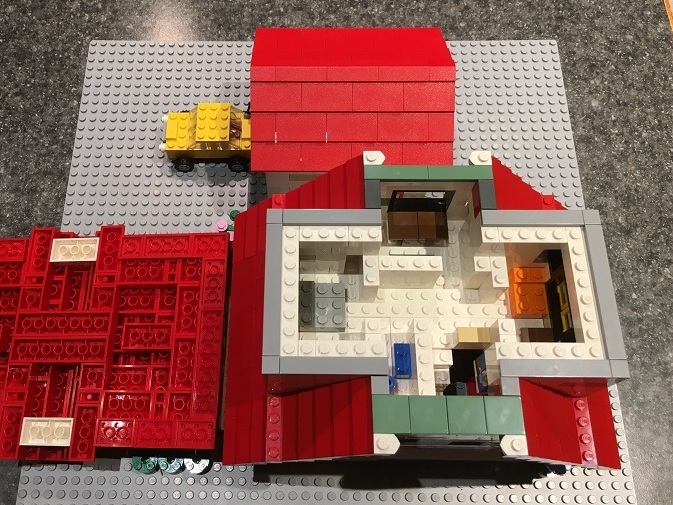 I had to scavenge bricks and roof tiles from my 2004 Lego Designer House kit, destroying it in the process – but that’s OK. The roof was a lot of fun to build. *Lego is short for leg godt, Danish words that translate to ‘play well’. 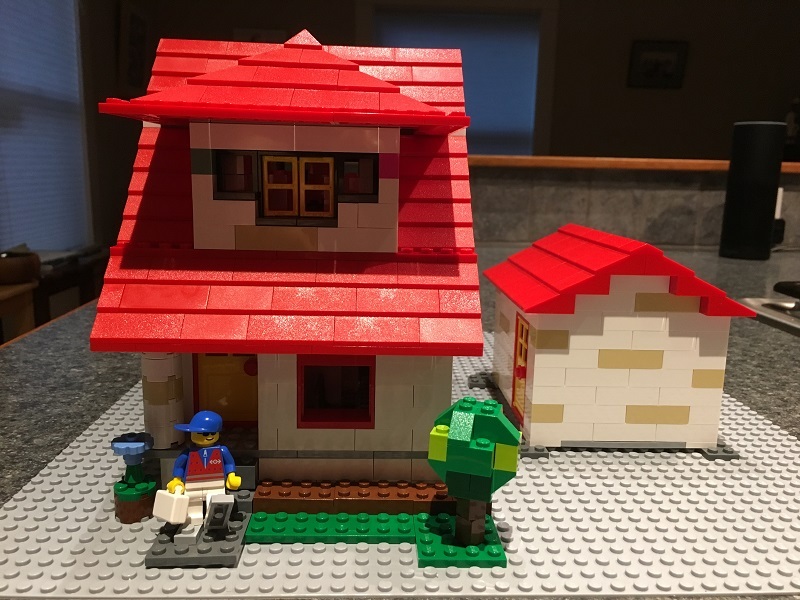 That’s the Lego ‘me’ on the porch, with the blue shirt and cap (Front). The real house is green with a grey roof! but hey, the white walls and red roof will have to do instead. 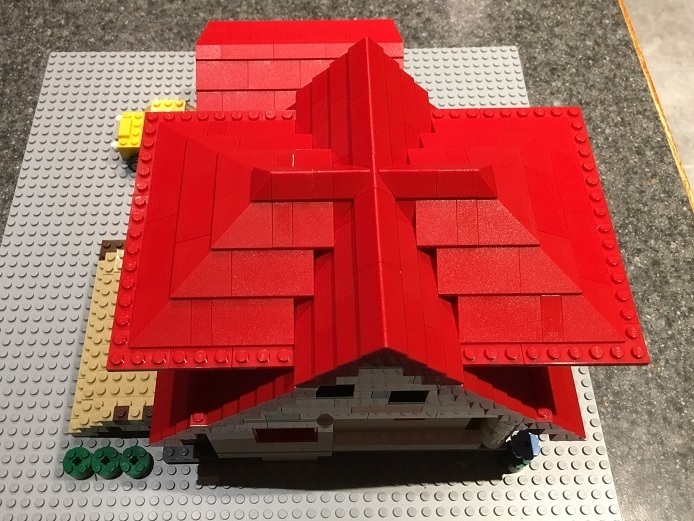 If I were really determined, I could special-order green wall bricks and grey roof tiles, on bricklink.com. It’s an online catalog that lists thousands of sellers and thousands of types of bricks. Lego has produced 400 billion bricks since 1958, in almost any square, round and triangular shape, and color, imaginable. I scan through the Wall Street Journal almost every day, at the public library here in my neighborhood. The weekend edition has puzzles in, and the two puzzles below are from this last weekend. (This is the link to the WSJ puzzle blog). 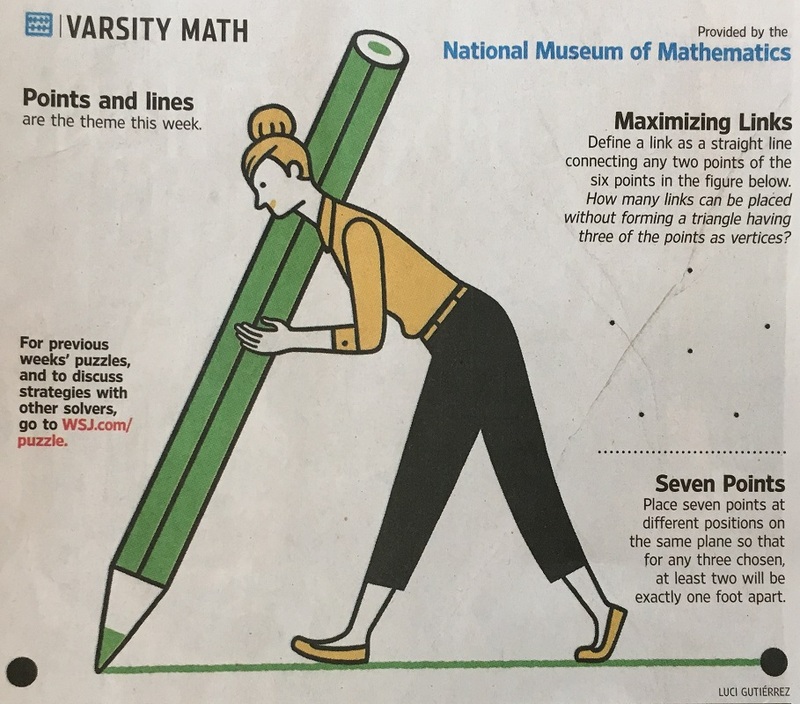 I think I know the solution to the ‘Maximizing Links’ problem .. but the Seven Points problem has me stumped .. but I’m working on it! Update Fri 4/6: Well, the solutions have been published. I got the first one right: 9 links can be drawn. Trying to solve the ‘Seven Points’ problem was a humbling experience, and I got close, but no cigar. 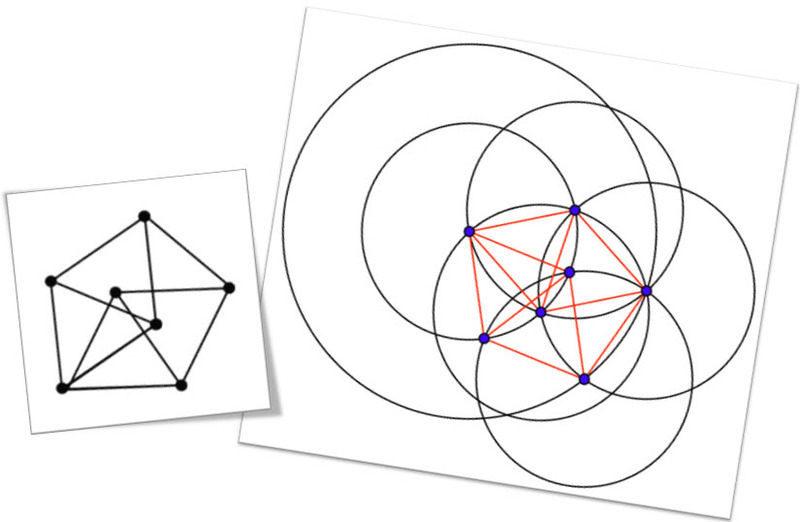 I knew the solution had to involve equilateral several connected triangles, but I should have applied more rigor, and maybe used a compass to arrive at the solution (as shown in the figure with the circles, from Math Stack Exchange). So depending on the way one looks at it, the solution is a regular pentagon, with two points carefully added to it, equidistant to three other points on the pentagon .. OR two diamonds pinned at a shared vertice (bottom left on the first diagram), and the other vertices a unit length apart. 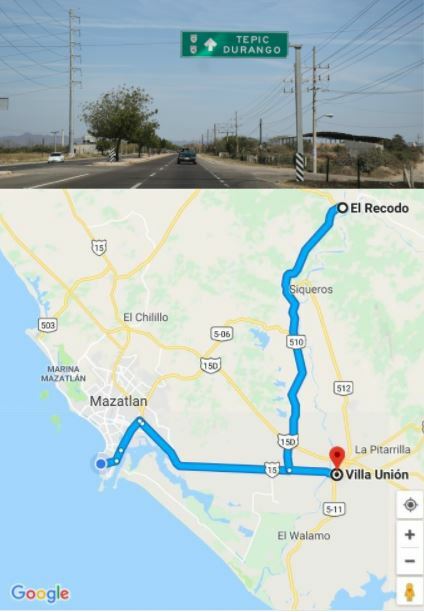 The drive to El Recodo is to the northwest is under two hours. Villa Union is just off Highway 15 on the way back. 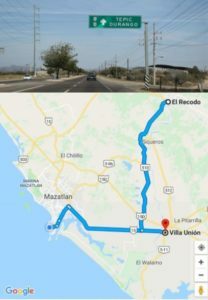 On Sunday, we drove out to the town of El Recodo and made a stop at Villa Unión for lunch at a famous seafood restaurant. We were very lucky to run into a tour guide in El Recodo to show us around. He also phoned ahead to the very popular restaurant in Villa Unión, which allowed us to get in almost right away. 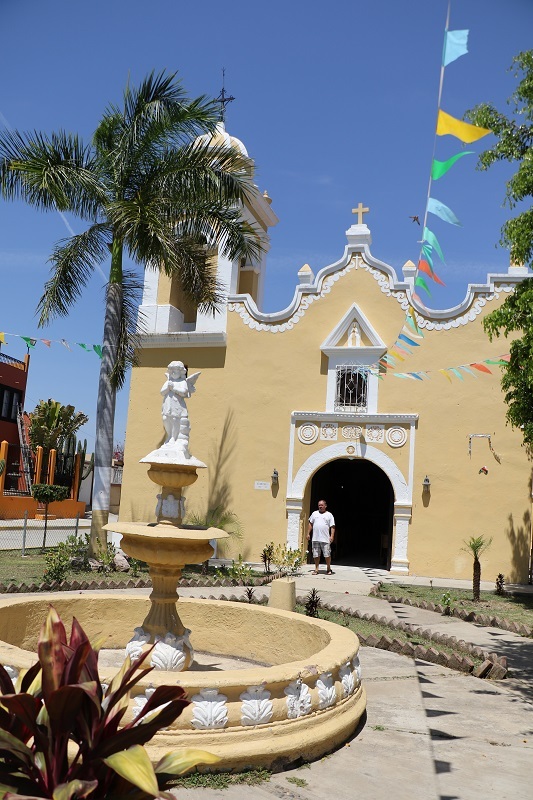 The church off the main street in El Recodo was built in 1855. The bell was made of all kinds of metal that were collected from residents. That’s Samuel, our impromptu tour guide of the church and the town at large. He seems to know everyone there! 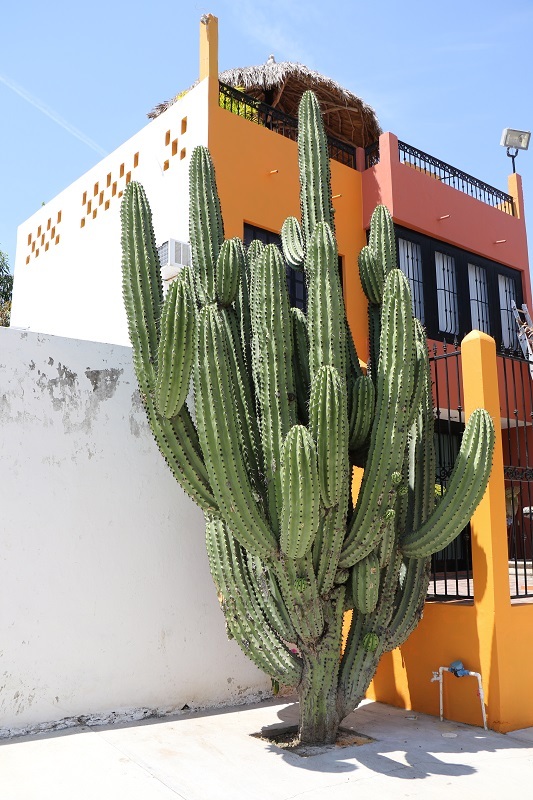 This is a beautiful Mexican giant cardon or elephant cactus, native to the area. 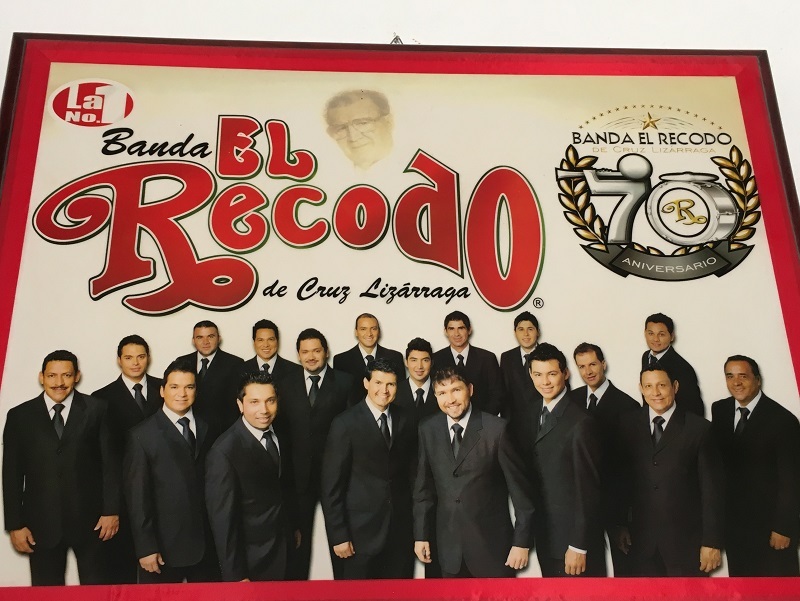 This picture is from inside a little museum dedicated to the famous ‘Banda El Recodo’ band and its founder Cruz Lizarraga (now deceased). It’s the centenary of Cruz’s birthday in 1918. 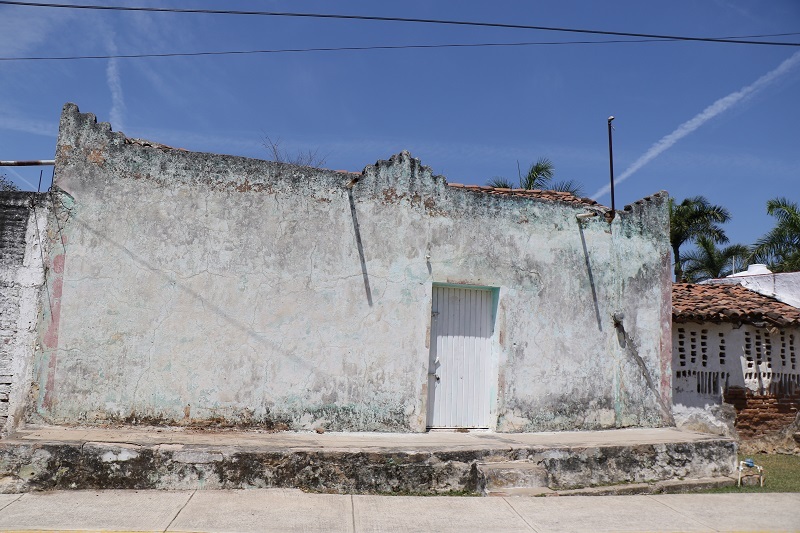 Just an old building with Spanish roof tiles that I liked very much -on a side street in El Recodo. 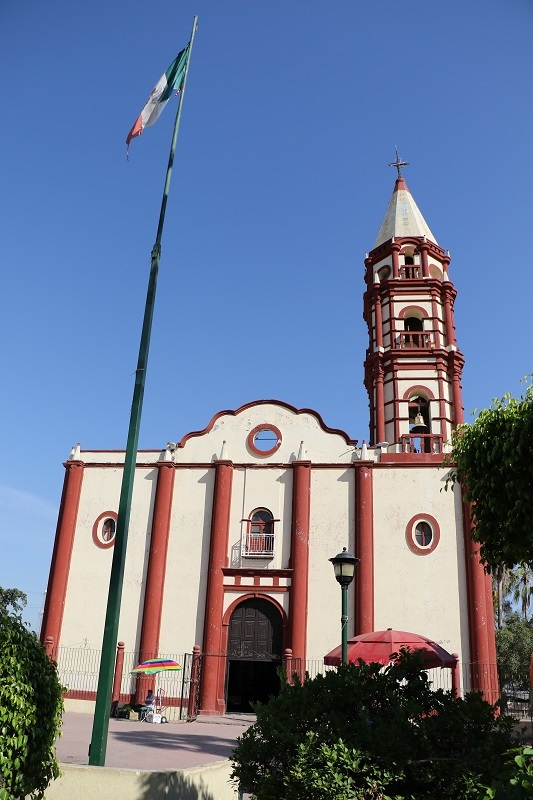 Here’s the Parroquia San Juan Bautista (Parish of San Juan Bautista) in Villa Unión, located on the main town square.